When Fields are Initialized, or "Lies Reflector Told Me"
The other day a coworker came to me with a Tricky Language Question. He and another chap had just finished working through a bug that had arisen due to a misunderstanding of C# constructor and field initialization order. The question? 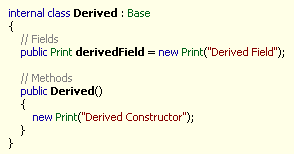 In a derived class, when does field initialization occur, relative the derived and base constructor code? Specifically, what does this output? Variable initializers are transformed into assignment statements, and these assignment statements are executed before the invocation of the base class instance constructor. This ordering ensures that all instance fields are initialized by their variable initializers before any statements that have access to that instance are executed. "What's the problem here?" you may be wondering - the Base code doesn't know anything about the Derived fields, so why go out of our way to make sure the field initializers are called before the Derived constructor? Virtual methods are the problem. If a virtual method is defined in Base and overridden in Derived, the overridden method may reference the new fields added to Derived. If the virtual method is called from the Base constructor, then we need those fields to be initialized before the constructor is called. Initializing fields even before calling base class constructors ensures that this is so. Or does it? What if the field I'm accessing in a overridden method in the derived class doesn't have a field initializer, that method is called from the base constructor, and the field value is set in the derived constructor? In this case, the field won't be initialized before the method is called - it will still have the default value for its type. So how to do we safely call virtual methods in constructors? We don't. You can't guarantee what code is going to go into a derived class's virtual method, so you never know what's going to happen. Reflector can tell you what's going on in your code. Forget any of those things, and you're lost.